Visit the places where these famous foods got their start, and savor their flavors at festivals and attractions you'll only find here. North Carolina is home to many unique foods, drinks and places to enjoy them. Several of our tasty treats are available around the country (and world), but there’s something special about experiencing a cold soda or hot donut in the place where it all started. Here are six of North Carolina’s great food stories. Pepsi-Cola began in a drugstore in New Bern in 1896 at the hands of pharmacist Caleb Bradham, with the aim to create a fountain drink that was both delicious and helpful in aiding digestion and boosting energy. Bradham’s drugstore housed a soda fountain where the small-town clientele would meet to socialize. By 1902, the demand from surrounding drugstores increased so dramatically that at the end of that year, he filed incorporation papers with the state of North Carolina indicating plans for corporate branches in Virginia, Maryland, Pennsylvania and New York. Only in North Carolina: Visit the Birthplace of Pepsi in New Bern, the actual site where Pepsi-Cola was invented. Step back in time and enjoy a fountain Pepsi, and browse through vintage signage, classic bottles and even Christmas ornaments. Known as the “nectar of the tarheels,” the wild cherry-flavored Cheerwine soda was created in the basement of L.D. Peeler’s wholesale grocery store in Salisbury during a World War I sugar shortage. The company has passed down through three generations of Peeler’s family, using traditional marketing for the growth of the brand throughout the South. 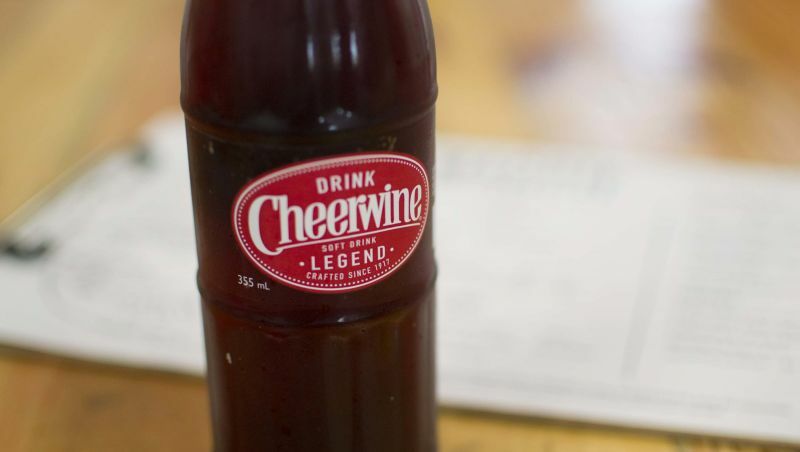 Cheerwine can now be found in several Southern states and California. Only in North Carolina: The annual Cheerwine Festival in downtown Salisbury each May. It’s a celebration complete with live music, a beer garden, Carolina pulled pork covered in Cheerwine barbecue sauce, commemorative Cheerwine merchandise and, of course, cold Cheerwine. From a modest beginning in 1926, with only a 3,600-square-foot building and $19,500 in capital, Mt. Olive Pickle Company has grown to manufacture the bestselling brand of pickles in the Southeast – and the second-bestselling brand of pickles, peppers and relishes in the country. Located at the corner of Cucumber Blvd. and Vine St. in Mount Olive, it’s the largest privately held pickle company in the nation. Only in North Carolina: The New Year’s Eve Pickle Drop is an annual tradition in the town of Mount Olive, featuring a lighted 3-foot pickle lowered from the company’s 45-foot flagpole into a preserved redwood pickle tank. Perfect for families, the celebration takes place at 7 p.m., which happens to be midnight Greenwich Mean time. Vernon Rudolph founded Krispy Kreme in Winston-Salem in 1937 and sold his first donuts for 25 cents a dozen after borrowing the ingredients from a nearby grocer. Today, Krispy Kreme produces millions of melt-in-your-mouth donuts a day, and it's known for the glowing red sign in shop windows indicating when fresh donuts are ready to eat. The company has grown to serve customers across the United States and around the world. Only in North Carolina: You might think eating donuts doesn’t mix with exercise, but it does when it’s for a good cause. Each February in Raleigh, more than 8,000 people compete in the Krispy Kreme Challenge, attempting to eat 12 donuts while running 5 miles in one hour, and raising money for the local children’s hospital. No, Texas is not the birthplace of Texas Pete hot sauce – nor was it developed by a man named Pete. The spicy condiment was actually developed in the 1940s in Winston-Salem. Three brothers, Thad, Ralph and Harold Garner; father Samuel Garner; and “Mother Jane” began their business making the sauce in pots on the cook stove in their family home. While the original secret recipe is its foundation, Texas Pete’s product line has expanded to include buffalo wing sauce, honey mustard sauce, chili sauce, pepper sauce, seafood cocktail sauce and more. Only in North Carolina: The Texas Pete Spirits of Summer festival takes place in downtown Winston-Salem in June, featuring live music, food, and regional beer, wine and spirits. Veteran restaurant owners Jack Fulk and Richard Thomas founded the first Bojangles’ restaurant in Charlotte in 1977. They based their concept on three attributes: distinctive flavor, high-quality products made from scratch and a festive restaurant design with friendly service. Today there are more than 600 Bojangles’ locations. Order like a local with a 4-piece chicken supremes (Bojangles’ version of chicken fingers) combo and a Bo-Berry biscuit for dessert. Only in North Carolina: It’s often “Bo Time” at football games, with fans taking advantage of the restaurant’s cleverly packed, large box of food. 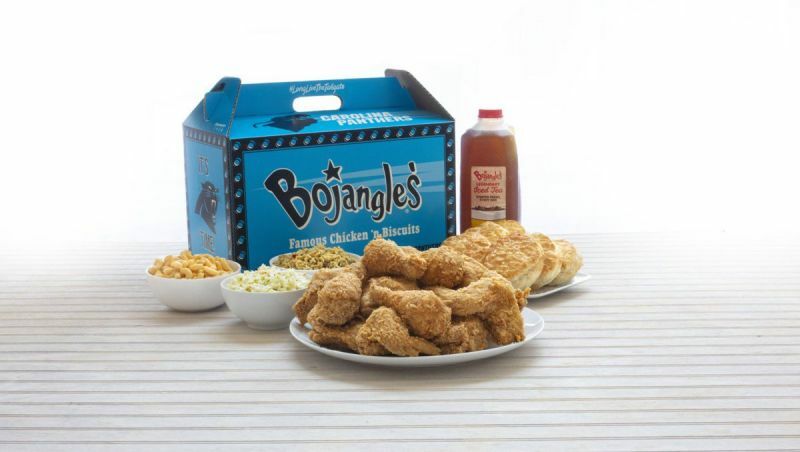 Bojangles’ is essential to the tailgating experience at Carolina Panthers home games in Charlotte, where the company is an official sponsor of the team. Shayla Martin is a Durham-based travel and food writer. She has contributed to The Wall Street Journal, New York Magazine, Atlanta Journal-Constitution, Fodors Travel and more.